When Bluegrass musicians Aaron Biebelhauser and his brother Adam performed for the Lower School on January 24, they had students clapping along. 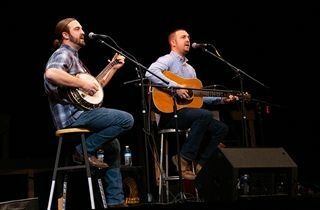 The brothers played a variety of traditional and modern songs and introduced students to a number of instruments, including the guitar, upright bass, banjo, and dobro. Aaron will return to KCD for a workshop with fourth graders on February 4. Aaron’s songs have been recorded by award-winning Bluegrass artists such as Del McCoury Band, Balsam Range, and others. His songwriting won first place at the Chris Austin Songwriting Contest at Merlefest and earned a nomination for the IBMA’s Song Of The Year Award. Thanks to the KCD Fine Arts Guild for making this opportunity possible for our students!